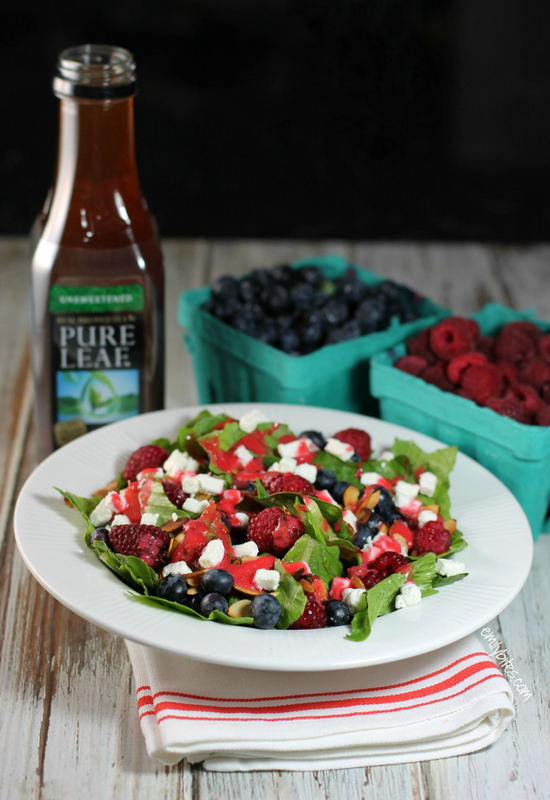 This Farmer’s Market Berry Salad is such a fresh, tasty way to celebrate the flavors of Summer. As many of you know, I’ve been working with Pure Leaf Iced Tea* throughout the season to come up with some delicious dishes, so when they asked me to head to my local Farmer’s Market and put together a recipe that would pair well with their fresh-brewed iced tea, I was so excited. 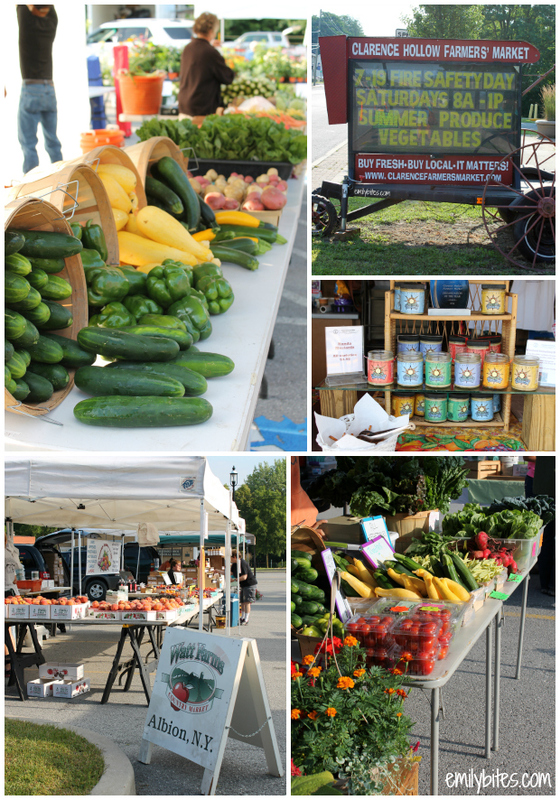 We are blessed in Western New York to have a ton of Farmer’s Markets in the area, and it’s great to have access to such flavorful, fresh-off-the-farm ingredients! I chose to go to the Clarence Hollow Farmer’s Market which is a smaller one that’s close to my house. The produce there was beautiful, and in addition to fruits and vegetables there are booths for local wineries, beef farms, and makers of local cheeses, mustards and dressings. It’s a food lover’s paradise! I picked out some bright, fresh raspberries and blueberries and some crisp, green Romaine lettuce for the recipe (and also some peaches and zucchini for myself). 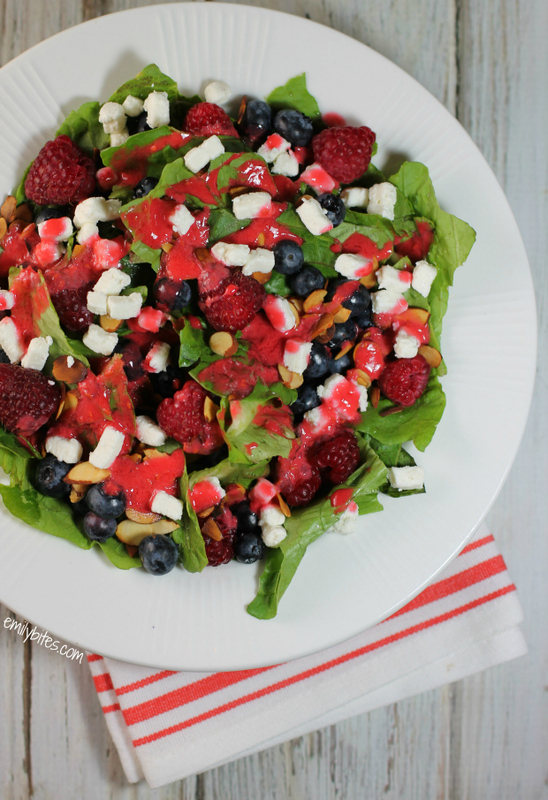 I love salads with berries and I thought making a fruity vinaigrette an cutting the vinegar with soft, creamy goat cheese crumbles and toasty, nutty almonds would be a great combination. It was! The bright, clean flavors in this recipe really allow all the fresh ingredients to shine and is a fantastic lunch recipe or light dinner. You could also add some grilled chicken to the mix to make it a heartier meal, or you could cut the servings in half and serve it as a side salad to a meaty main course. Just make sure you don’t pre-dress any salad you want to save as leftovers. Of course, the salad also pairs beautifully with the fresh taste of an ice cold glass of Pure Leaf Iced Tea – so refreshing! Iced tea and berries are always a good combination. 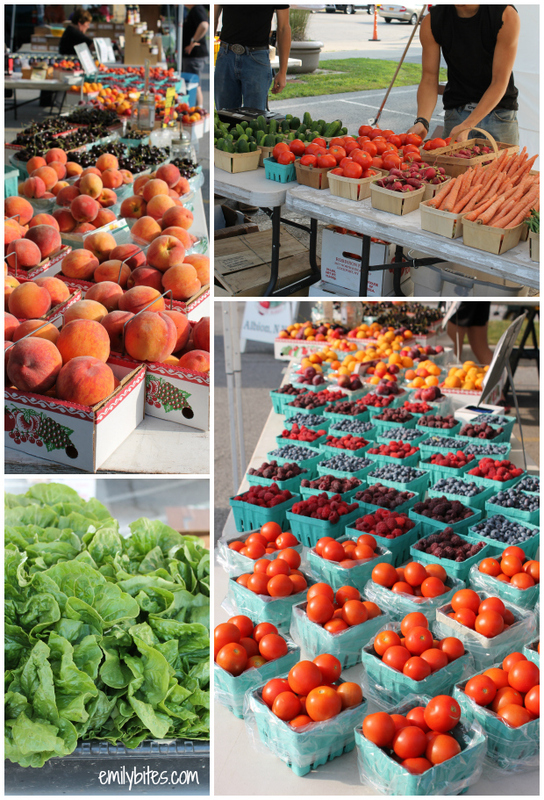 Need some reasons to stop by your own local farmer’s market? It’s a great way to get the freshest produce possible since it usually comes directly from a local farm instead of being shipped to your supermarket. This also means the foods retain more nutrients, as produce generally loses some of its nutrients as time goes on. You also may see more diverse variations of produce (for example, my market had dark purple raspberries in addition to red, which are not carried in my local grocery store) and since you’re often interacting directly with farmers and their families, you can learn a lot about your food and where it comes from. Of course, by shopping at local markets you are also supporting your local economy and helping to keep local farms in business by cutting out the middle man and packaging costs. It’s a win-win! The connection between Pure Leaf and Farmer’s Markets doesn’t end at shared freshness. One of the reasons I’m excited to partner with Pure Leaf this Summer is their work with Wholesome Wave. Wholesome Wave is a nonprofit organization with a mission to increase access to (and affordability of) fresh, locally grown food through programs that work with neighborhood farmer’s markets and encourage those in under-served communities to make healthier choices and buy local produce. Through Pure Leaf’s “Share the Love of Leaves” campaign, they’ve already donated $100,000 to assist Wholesome Wave, and you can help them to donate more! For every “share,” “like,” or comment on their Facebook or Tumblr pages, Pure Leaf will donate an additional dollar to the cause, up to another $50,000. You can also help by snapping a fresh photo at your local farmer’s market and sharing it on Twitter or Instagram with #LoveofLeaves and your location tagged. Then visit www.TheLoveofLeaves.com to see your photo on our map. You might even get a special surprise! How easy is that? If Pure Leaf reaches their goal of a full $150,000 donation it will help Wholesome Wave provide 100,000 pounds of fresh, local grown fruits and vegetables in communities all across the country. That’s worth a “like” isn’t it? Combine 1/3 cup of the raspberries with the vinegar, honey, lemon juice and olive oil in a blender and blend until smooth. You should have about ½ cup of dressing. If you’re a little short, toss in a few more raspberries and blend again. Bring a dry skillet over medium heat and add the sliced almonds. Cook for several minutes, stirring every 30 seconds or so until almonds are toasted and golden. Remove from skillet. Place 2 cups of lettuce into each of four bowls* **. Top each bowl with ¼ of blueberries, ¼ of raspberries, a tablespoon of the toasted almonds and 0.75 ounces of the goat cheese crumbles. Drizzle 2 tablespoons of the dressing over each salad. *If you prefer your lettuce to be tossed in the dressing, do this before adding the other toppings. ** If you are serving this as a side salad, you may want to halve the servings. I just stumbled across your blog recently and even tried a few of your recipes already like the meat lovers pizza. I had no idea that I lived so close to you haha! I have never made it to the Clarence Hollow Farmers market, but when I read that I was like, Clarence Hollow is not a common name. I live in the town over in Akron! It is exciting to follow a blog I like and know I can find the ingredients because we live in the same area! could you substitute strawberries for this instead? I am definitely impressed by the way you detailed out all the things. It is actually going to help me quite a bit. Thanks for sharing this so clearly.